Advisors to high net worth families work hard to help their clients minimize their taxes and ensure that the fruits of their hard work, their assets, can be passed on to younger generations. One strategy for transferring wealth to younger generations and reducing tax liability is to use a “stretch IRA” strategy. This strategy involves naming younger beneficiaries to IRA assets to lower the inherited Required Minimum Distribution (RMD) and preserve the growth of the account for a longer period of time. We are pleased to announce that the Stretch IRA calculator is now available in TRAK-Online! Your client will need to begin taking RMDs from their IRA at age 70 ½. The RMD is calculated every year by taking the previous year’s ending balance and dividing it by the account owner’s remaining life expectancy. If the account owner names a younger beneficiary, such as a child, grandchild or even great-grandchild, then the inherited RMDs for the beneficiary will be much lower since their life expectancy will be longer. This allows the beneficiary to reduce their tax liability by taking a lower distribution amount which also allows more money to remain in the IRA, allowing continued growth of the account. RetireReady Solutions is pleased to announce to release of the Stretch IRA calculator for TRAK-Online. 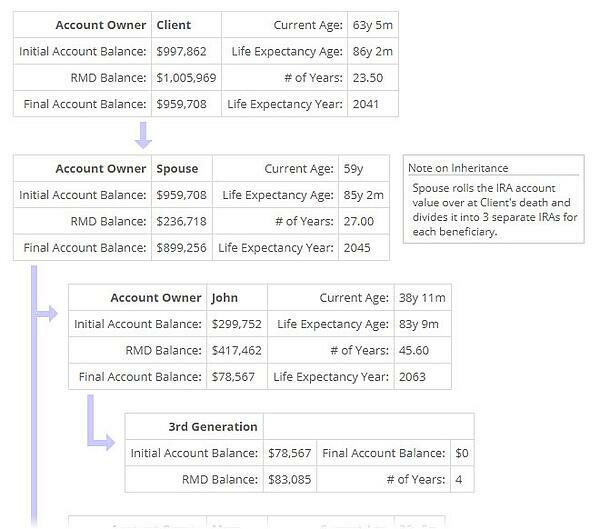 This new calculator helps advisors educate their clients on wealth transfer scenarios. The Stretch IRA calculator has been a staple of The Retirement Analysis Kit (TRAK) Windows-based software for many years, but today’s release makes it available to subscribers of TRAK-Online, the cloud-based version of the software. The advisor can include the spouse as an initial beneficiary and/or children and grandchildren as the beneficiaries of the inherited IRA. Estate information can also be included to calculate any applicable estate taxes. Colorful visuals, grids, and a unique flow chart help clients to easily understand the strategy and its benefits. Advisors seeking to help their clients transfer their hard-earned wealth to future generations should take advantage of this unique tool. Current users of TRAK-Online who are subscribed to all the calculators will have the Stretch IRA calculator automatically added to their list of available calculators.